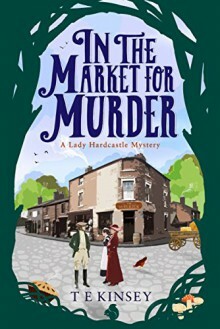 This is the second in the Lady Hardcastle mysteries, and I didn't enjoy it nearly as much as the first. The story felt disjointed and cobbled together. There were three separate (for the most part) mysteries, and they didn't really come together until the end, and then that felt somewhat...half-hearted. I still enjoyed the back and forth between Lady Hardcastle and Flo, though the charming eccentricity that Lady Hardcastle possessed in the first book seemed to have been upped some, making her--at times--almost annoying. I've decided to set this series aside and move on to other books. I think I'm going to set this series aside for now. 1. This is one of those KU books where you get both the kindle edition and the audiobook when you borrow it. I started the audiobook, but the character's voices/accents as done by the narrator didn't match what I already had in my head from reading the first book, so I couldn't hang. This is absolutely not a knock on the narrator. She did a lovely job with the little bit I heard, and had I started the series in audio format, I'm sure I would have loved it. 2. I'm not sure I'm going to be able to hang with the series as a whole as the author is again mentioning dribs and drabs of events that happened outside of this book without elaborating on them whatsoever. This time the events were another mystery (set at a circus, no less!) that happened between the first and second book. Once again, I had to check to see if I accidentally borrowed the wrong book, because with the way the characters talk about it, I feel I should know what happened, but don't. I may just need move on...especially when TA is dangling a promising new-to-me British Police procedural series in front of me. And it's available on KU.